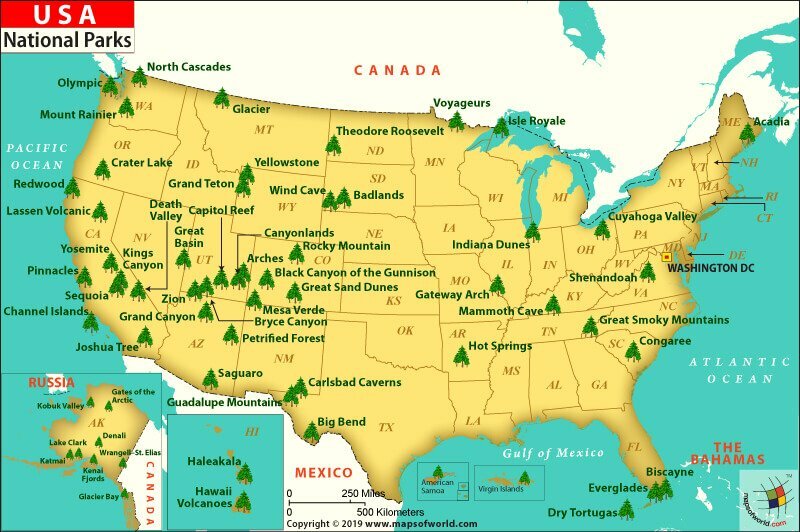 There are 58 national parks in the United States. The National Parks Service of the United States, an agency under the federal government, is responsible for controlling the national parks across the country. These are places of natural significance, protected by the government against encroachment and are visited by many tourists every year. Map description : This clickable map shows national parks spread across the United States. Clicking on a state will lead you to a zoomed-in version of it with the parks shown on a bigger level. The map is also easy to download. In the words of John Muir, who is known today as the Father of the National Parks, "wildness is a necessity." Thousands of vacationers and families visit national parks in the United States to get the good tidings of nature by hiking, backpacking, kayaking, and fishing. The United States is known for the spectacular variety of its natural landscapes. The captivating scenery and rugged charm of its many natural attractions are best witnessed in the 58 National Parks and Nature Preserves that dot the country. Yellowstone National Park : The very first national park in the world, Yellowstone National Park was established in 1872 and is spread in three states: Wyoming, Idaho, and Montana. The park is one of the most visited natural attractions in the country and is most famous for Old Faithful, its well-known geyser, as well as many other geothermal features. Yellowstone offers a rich variety of wildlife, including grizzly bears and herds of bison. Of all the other national parks in America, Yellowstone is arguably the wildest and certainly the most universal in its appeal. It's a magical land of waterfalls, geysers, rainbows, and canyons. Glacier Bay National Park : Located outside of Juneau in Alaska, Glacier Bay is famous for its many glaciers. The park is a UNESCO World Heritage Site, accessible only by ship or plane which helps preserve and protect this area. Glacier Bay National Park is home to wildlife including grizzly & black bears, moose, deer, and sea life like seals, sea lions, dolphins, whales, salmon, and more. Yosemite National Park : Central California's Yosemite National Park covers parts of the Sierra Nevada Mountains and the Yosemite Valley. This park is known for its waterfalls, Giant Sequoia redwood trees, wild mountain scenery, and variety of wildlife. Grand Canyon National Park : One of the most visited natural attractions in the world, the Grand Canyon is located in Arizona. The park offers spectacular views of the canyon landscapes and the Colorado River that flows through the canyon. Redwood National and State Parks : The Redwood National and State Parks, a World Heritage Site, houses the tallest trees in the world. The park boasts a rich legacy of natural as well as archeological heritage. It is home to some of the prominent historic buildings such as Huffman Ranch, Prairie Creek Fish Hatchery, etc. Channel Island National Park : Spanning over five of the California Channel Islands, the Channel Island National Park exemplifies biodiversity at its best. Whether you are a sports lover or a person with fine aesthetic sense, the park has something to offer to everyone. Denali National Park : Denali National Park, located in the Alaska Range, includes North America's highest peak, Mount McKinley, and is home to bears, caribou, sheep, moose, and many types of birds. Canyonlands National Park : Located in Utah at the confluence of the Colorado and Green Rivers, Canyonlands National Park offers some of the most breathtaking views of the outlying canyons and gorges. The park is separated into four major areas, namely the Island in the Sky, the Needles, the Maze, and the rivers. Arches National Park : Also located in Utah, Arches National Park is named for the more than 2000 natural sandstone arches created by the process of natural erosion. The desert landscapes are home to such wildlife as bighorn sheep, mountain lions, reptiles like the Western rattlesnake, and plants like the prickly pear cactus. Everglades National Park : Located in the state of Florida, Everglades National Park consists of a unique tropical ecosystem of vast marshlands, lush with sawgrass and cypress trees. The park is also home to alligators, crocodiles, panthers, and over 300 species of birds. Great Smoky Mountains National Park : The Great Smokies in Tennessee is the most visited national park in the US. With a stunning diversity of flora and fauna, it's a splendor of 521,454 acres with up to 800 miles of multipurpose trails. Visitors can indulge in recreational activities such as hiking, camping, fishing, horseback riding, and zorbing. Conquer the Appalachian Trail, take a walk along mist-shrouded mountains and hidden waterfalls, and discover rural countryside for the vestiges of Appalachian traditions dating back to simpler times. Rocky Mountain National Park : Straddling the Continental Divide with 76 summits, the alpine beauty of Rocky Mountain National Park in northern Colorado is rivaled by only a handful of destinations in the world. The scenic Trail Ridge Road and the Old Fall River Road cut through dense pine forests and 412 square miles of park's area. The park is a premier destination for those who love the outdoor thrills such as skiing, hiking, and rock climbing. Zion National Park : Characterized by 15-mile-long Zion Canyon's steep red cliffs, this national park in southwest Utah features unique geography of the Great Basin, Colorado Plateau, and the Mojave Desert regions. Guided nature walks, horseback riding trips, and evening programs in summer are treats to visitors. Taylor Creek and Kolob Arch are popular hiking trails undulating through mountains, mesas, buttes, and natural arches. Olympic National Park : A jewel in the Pacific Northwest's Crown, the Olympic National Park is home to old-growth temperate rainforests, rugged Pacific beaches, and sub-alpine meadows. The Hurricane Ridge viewpoint allows breathtaking sights of snow-capped summits. With an elevation of 2,432 meters, Mount Olympus, which supports large glaciers, is the centerpiece of this national park. Grand Teton National Park : Out west everything has its own wide space and Grand Teton in Wyoming is no exception. Located only 10 miles south of Yellowstone, Jackson Hole is a popular attraction in this national park. A popular destination for adventure recreation, it accommodates 1,000 campsites and over 200 miles of hiking trails to get lost under the big blue skies. Acadia National Park : Established in 1916, this national park in Maine is famous for more than 120 miles of hiking trails, 50 miles of carriage roads, glacier-carved summits, pink granite cliffs, offshore rugged islands, inland lakes, and cobblestone beaches. Mount Desert Island comprises the lion's share of total national park acreage. Despite its relatively small area, Acadia is the second most visited national park in the US. The Park Loop Road winds its way through a number of major attractions.